"Denial and existential climate threat are a stable pair." We hesitate to write about the march of hurricanes across the Atlantic as our weekly post because it is social media trending so strongly we probably have little to add to that conversation and besides, we said it all in Climate Crisis: The Greenhouse Effect and What You Can Do in 1990. Nothing much has changed since 1990. Industrial civilization, fueled by the consumer culture, has continued its exponential growth in all the metrics; population, urban sprawl, extinctions, pollutants, resource depletion, and the build-up of greenhouse gases. Exponents have an arc like a child moving forward on a swing — they pass through level, begin to climb, and momentum pushes them towards vertical until they collide with a wall of gravity and fall backwards. The child delights in this and immediately wants to repeat, pushing higher and higher. There is a reckoning coming. We all know it although some of us are better at denial than others. Timing is always a dicey game. That is how climate scientist Stephen Schneider put it when he lectured Congressional committees in the 1980s — a game of dice. The more you load the dice, the more predictable the outcome. Charles Tuttle set up a table to sell a range of Trump gear, and said business was good. Tuttle said he had even sold a couple of baseball caps, featuring the presidential seal and Trump signature, despite a hefty $75 price tag. Notice that the caption says the middle view of the State’s contours arrives in the event Greenland drops its ice cover. For reasons we described last week we think Greenland is going to stay cold for a while, because AMOC (the Atlantic Meridional Overturning Circulation) is slowing, reducing the flow of warm water from the Equator towards the Arctic. There are signs in the paleoclimate record that melting ice sheets may have once slowed or stopped the AMOC for decades at a time — triggering massive shifts in monsoon rainfall in Africa and India, changes in hurricane patterns, and even mini ice ages. Most climate projections assume that the AMOC might weaken, but would still persist even as global temperatures creep steadily upward. But climate scientist Wei Liu at Yale University suspects that these models overestimate the AMOC’s stability, according to a new study recently published in the journal Science Advances. What is not slowing is the breakup of the West Antarctic Ice Sheet — the right-most concept for Florida mapmakers in our 1990 projection. These changes do not happen gradually. Typically coastal contours respond to major storm events. The tide comes in. It doesn’t go out. If we had been delusional, we might have imagined in 1990 that merely getting the word out would make a difference. For reasons that have been well articulated now by cognitive scientists, human denial — a DNA-level defense mechanism — goes into overdrive when our survival is placed into jeopardy. Denial and existential climate threat are a stable pair. We are penning this on a Friday morning and, via You Tube, there is an image CNN’s weathermen created for the audience in Miami. 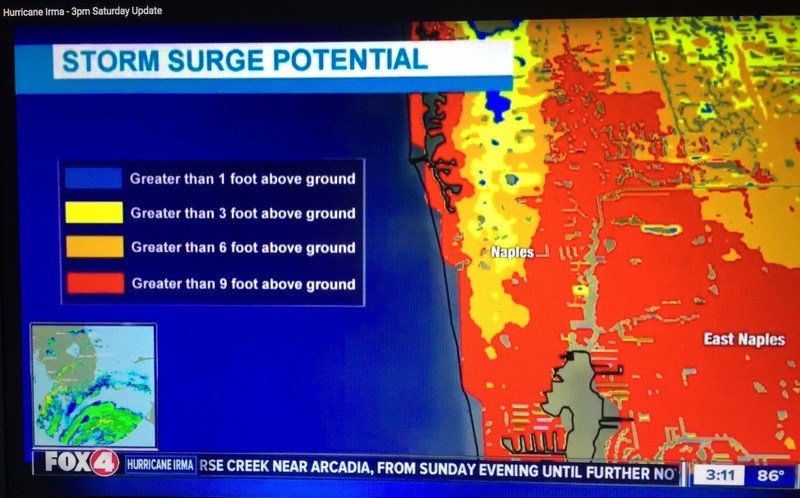 Using Google Earth, they projected what a 5 to 7 foot storm surge on the “dirty side” of the storm will look like for Miami. UPDATE: As of 5 pm Saturday Irma is tracking more Westward. 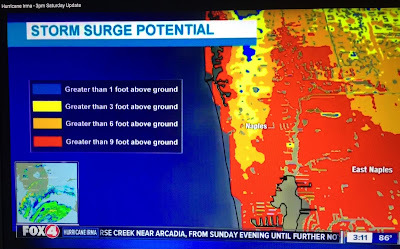 They are forecasting 9 foot of surge over Naples, Fort Meyer and to 16 miles inland. Fare well, Houston. Fare well, Naples. May you hold up a lantern that finally cuts through our collective fog.